One of the all time popular indoor plants are the Rhapis Palms. You will find in it homes, commercial buildings and stores around the world. So what makes the Raphis palm so popular. It is the indestructible nature, the great foliage, the easy care and the ability to grow well in low light that are added together to make this a great plant. These are an understory plant from sub tropical climates, they naturally grow well in low light.They are also slow growing, another feature that makes then popular. Rhapis Palm or Lady Palms. Rhapis Excelsa or Lady Palms are one of the most popular indoor palms available. Slow growing and very decorative Rhapis Palms do well indoors as well as outdoors in a sheltered environment. Rhapis Palms and Japanese Rhapis Palms are a hardy palm that will grow well indoors and is a favourite for indoor landscape work. The Rhapis Palm will cope well with low light situations with both variegated and green foliage varieties being available. The Variegated Rhapis Palm is pictured right. Although they are grown as an indoor plant, in warmer climates they can be grown outdoors, as long as they get the shade they need. All Rhaphis palms will benefit from some time outdoors in warmer weather, especially on rainy days where they will get cleaned by the rain. These are a slow growing palm and over time they will get to around 4m. 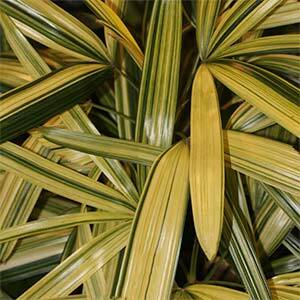 Best suited to filtered light, they tend to loose foliage colour and burn in direct sun. Height – To 4 meters over time. Soil Humus rich well drained. Drought Tolerant – Medium, the Rhapis Palm will cope with short term dryness.